This weekend for me was all about catching up with friends, and packing. I go into panic mode when I have to pack for a holiday because I hate forgetting things. To not have the ‘stuff’ I need while away makes me stress. So when getting ready for a holiday I write lots of lists, and mostly stand around staring at my bedroom and bathroom thinking of things I need. Mainly staring more than thinking. So where am I going? I’m off to Bali on Thursday for a much needed break. I’ll be gone a week so you won’t see a post next Monday! With all the packing and catching up, I didn’t get around to much cooking. I did however make this yummy pudding for a friends going away dinner that never happened. Friday night I got home from work, rushed to the shops to pick up some apples and ice-cream, then came home and whipped this up. While in the oven I get a call from my beloved saying everyone’s going to the pub now. Dammit. I doubled this recipe to cater for a few people, so was let with two puddings and no dinner. Called my brother and gave him one. With one spare, I took it around to Colin’s (the place we were supposed to be having dinner) plus the ice-cream. Well, this kind of worked out well - there was no dinner prepared before pub time, so we all devoured the pudding for dinner. I ate pudding for dinner. It’s not a first for me, but usually if I am to do this I would eat it at home while on the couch, where no one’s know I ate pudding for dinner. There’s a couple of ways to make this. 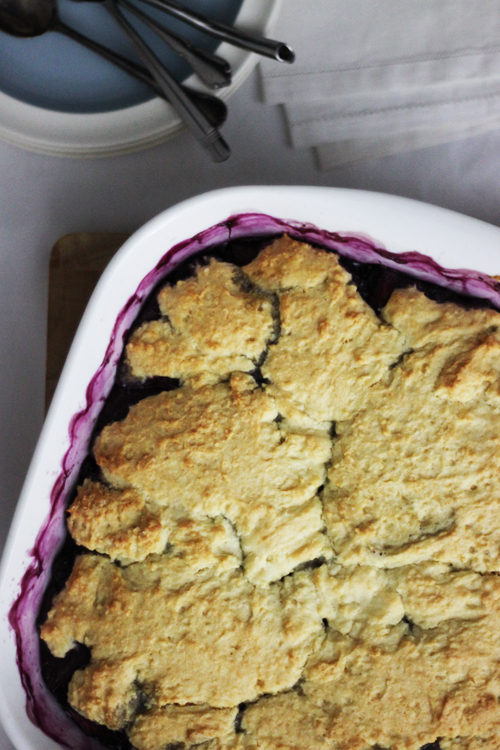 This recipe comes from Donna Hay’s book Seasons, and originally she has written that you stew the fruit in an oven-proof dish over a stove-top then place the cobbler on top and into the oven. I don’t have that kind of dish so I just stewed them in a saucepan then placed them in a ceramic baking dish. Also, I didn’t have oats, and to save buying a whole bag for ¼ cup, I just doubled the coconut amount. In a rush, I also forgot the dust the pudding with icing sugar! 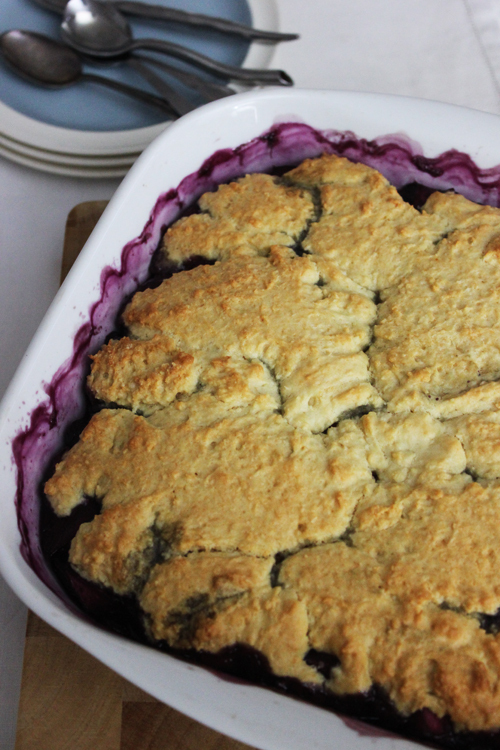 Would have been a nice finish to the crispy and fluffy cobbler with lovely sweet and syrupy fruit underneath. 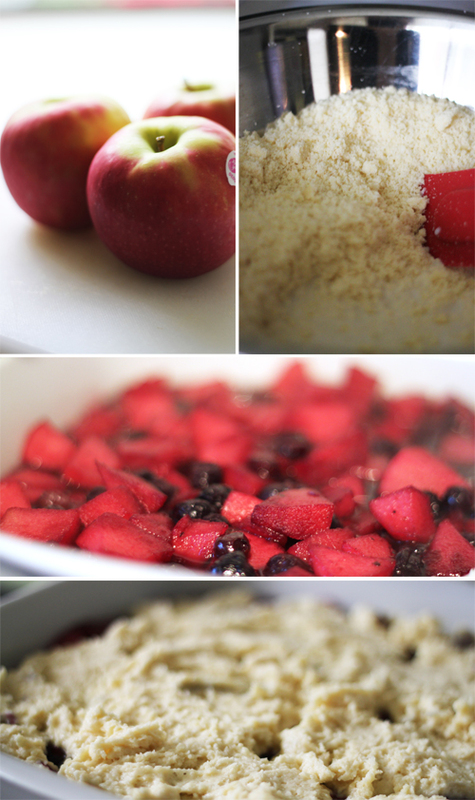 In a saucepan over medium heat, add apples, blueberries, sugar, lemon, water & vanilla. Bring to the boil and cook for 5 minutes or until apples are just tender and a nice syrup has formed. Discard vanilla bean. In a food processor, place the flour, sugar and butter and process until the mixtures resembles bread crumbs. Place mixture in a bowl and add the milk and vanilla and stir in well. Add the coconut and oats and stir. Place the stewed fruit into a 18 cm oven proof dish (1 litre capacity) and spoon the coconut mixture evenly on top. Place in the oven and cook for 25-30 minutes or until a skewer comes out clean. Dust with icing sugar and serve with ice cream. Wait... so the apples turned red?!! that is so beautiful!!! and oh so sweeet! Haha, it was the blueberries that made them red, but then purple :) Those little guys produce a powerful colour! I'm imagining the phone call to your brother. If it was my brother he'd be wondering if it fell on the floor first or something. He's highly suspicious like that but is generally a dustbin for any spare food. This reminds me of a recipe my mum used to make. Yumm..
Really pretty pictures. Looks rad!